Over the 20+ years of her career in animal health research for the government, Linda worked through three iterations of our agency. She first joined the Central Veterinary Laboratory (CVL), which became the Veterinary Laboratories Agency (VLA) in 1995 and later the Animal Health Veterinary Laboratory Agency (AHVLA) by the time she left in 2012 . I joined CVL in 1990 and worked as a research officer in the epidemiology department contributing to investigations of the transmission of BSE in cattle, particularly cases born after the introduction of the feed ban. These investigations were conducted in close collaboration with the Pathology and Virology departments and confirmed that the main source of infection for cases of BSE in cattle born after the feed ban was feed contaminated with meat and bone meal intended for inclusion in non-ruminant species. I also conducted a case-control study which contributed to the evidence supporting the fact that BSE was also maternally transmitted. One of Linda’s most influential scientific papers was published in the esteemed journal Nature in 1996. It has to this day been cited over 478 times. 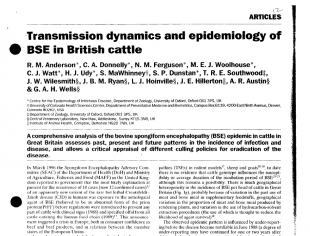 A comprehensive analysis of the BSE epidemic in cattle in Great Britain, it assessed past, present and future patterns in the incidence of infection and disease, and allowed a critical appraisal of different culling policies for eradication of the disease. In 1994, I initiated a long term investigation of scrapie in sheep and recruited and led a multi-disciplinary team which carried out surveys, longitudinal studies and theoretical work and took the lead in European collaborations on scrapie. The work carried out by this team provided the evidence to support the National Scrapie Plan which introduced genetically resistant rams into the national flock to reduce the incidence of disease. Between 2007 and 2012 I led the delivering intelligent surveillance project to provide evidence to improve animal health surveillance in the UK and contributed to international discussions about the development of surveillance methods including the use of risk-based surveillance. After graduating from the Helsinki School of Veterinary Medicine (Finland), Malla spent four years doing mixed veterinary practice work in Finland and in the UK. Following her strong interests in overseas development work, she spent five years in Africa and Latin America broadening her perspectives. In the state veterinary services in Botswana her work focused on meat hygiene, rabies and foot and mouth disease (FMD) control. 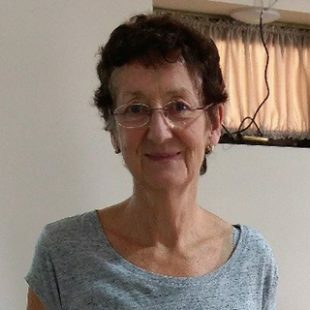 In Nicaragua she was involved in epidemiological research and disease control in a large-scale dairy revival project in the central highlands. Completing her formal training with a Master of Science (MSc) in Tropical Veterinary Medicine (University of Edinburgh) and a doctorate (PhD) in Veterinary Epidemiology and Economics (University of Reading), she spent the following 10 years leading academic research on cattle diseases and organic livestock production at the University of Reading. As a researcher Malla was ahead of her time, advocating for a reduced use of antibiotics in livestock production against strong commercial/industry resistance in cattle and sheep practices in the 90s and early 00s. One of Malla’s many scientific publications from her time at the University of Reading. To this day, her depth of knowledge on farm animal production within an organic setting is still sought after. 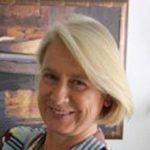 Joining AHVLA in the early 2000s, Malla worked within the State Veterinary Service (SVS) in England and Wales for approximately 12 years, the last six as Head of Veterinary and Science Advice to Defra’s bovine tuberculosis programme. There she brought a strong focus on the natural science evidence base relevant to disease control and supported many female young scientists in getting their voice heard in a predominantly male policy area. Since retiring from her veterinary epidemiology career in 2017, Malla has embarked on a new adventure in her 60s, re-training with the Now Teach-programme to become a qualified science teacher in secondary schools, to promote science studies among girls. After a period at Southampton University Medical School and then in the Public Health Laboratory Service (PHLS-now part of the Health Protection Agency) I returned to the VLA (as it had become) in 1991. By that time there were a few more women in senior positions but it was still a male network-orientated organisation and, like others, I had to fight for recognition. My big asset was my prior association with the PHLS and a growing awareness by the Ministry of Agriculture that they had responsibilities for the microbiological safety of food production (BSE and rising rates of Salmonellosis and then Campylobacteriosis reinforced this). The informal contacts I had eventually led to a formal Memorandum of Understanding with the PHLS. At the same time, the extensive international network I had developed during my PHLS years helped to build a growing relationship with various other veterinary organisations throughout Europe, in particular I was awarded the F. C. Donders Chair at the University of Utrecht in 1993 (becoming I think the first ever professor on the staff at the VLA). Eventually this led to the funding in 2004 of Med-Vet-Net - an EU Network of Excellence to research zoonoses which I directed for 4 years. This network still exists and has just been expanded and extended by the EU so remains a lasting legacy for my efforts. I retired from the VLA in 2008 but remained a consultant for them for several further years. 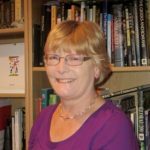 Since her retirement Diane has continued to publish and undertake consultancy work worldwide. 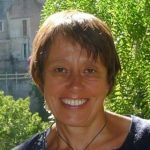 With a long-lasting interest for public engagement in science, she is a Trustee of the Winchester Science Centre and remains academically active as a Visiting Professor at the University of Surrey Veterinary School. In 2009 she was appointed an Officer of the Order of the British Empire (OBE) for services to science. Debby Reynolds in Georgia, October 2018. 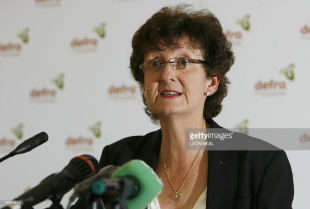 Debby served as the Chief Veterinary Officer (CVO) of the United Kingdom from March 2004 until she retired in November 2007, and was the first woman to hold that post. The CVO (with the additional title of Director-General, Animal Health and Welfare) is the Government’s chief spokesperson on all animal health and welfare issues. Dr Reynolds had responsibility for shaping UK animal health policy and influencing its delivery through the various Government executive agencies. Debby Reynolds will be instantly recognisable as the public face in the media, dealing with crises such as the FMD outbreak in 2007. Between 1994 and 1997, Professor Reynolds was Head of Bacteriology at the VLA. There were two occasions in my veterinary career when being a woman appeared to be a disadvantage. The first was getting into veterinary school. The odds of being offered a place depended as much, or more, on gender than on academic or practical achievement in the late 60s. The class of 32 students at University of Bristol had just seven women but when that ratio changed in later years it really opened up the profession to women. It was hard then to pinpoint the discrimination but it was universal. The second occasion, more personal, was at interview to join MAFF, as it then was, when seeking a move from my research job to become a member of the State Veterinary Service. One panel member, with a very senior role, opined that it would be very unlikely for me to get a role in MAFF since I was married, would no doubt have children and my (then former) husband was living abroad! You can imagine this was not something I took lying down, but was still pretty surprised to get the job. Several people and events guided me along the way to CVO. A passion for the natural world began at a very young age and was fostered by my uncle who loved biology and a special junior school teacher. The sciences clicked in and enthralled me in senior school. I can thank The Abbey School, Reading, and the farm vet we had for cattle and ponies at home, for managing to get enough A level results and experience out of me to go to Bristol. After graduation the involvement in science developed to PhD level, thanks to several mentors including Walter Plowright, who developed the vaccine for Rinderpest. But the lure of science was offset by being too remote from reality and so a series of roles followed which took me closer and closer to the influential domain of policy making, moving between diverse roles at intervals of about 3 years. This constant change of jobs all took place from a home base in Berkshire and depended on the tremendous support of a long suffering loyal family. The experience of FMD in 2001, being appointed to the Food Standards Agency as Veterinary Director, working with Lord John Krebs, and having the chance to work in the rough and tumble of the World Organisation for Animal Health (OIE) and European Union (EU) policy making paved the way for my appointment as the first female UK CVO and Director General animal health in 2004. 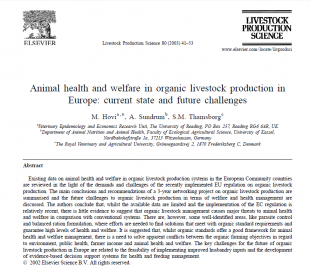 2004 was the era of the Animal Health and Welfare Strategy, the Page Street office , legacy of BSE and FMD and emergence of avian influenza (AI). The front-and-centre consumer voice and role of stakeholders came naturally and morphed into core groups of people who had great influence on animal health. It was also the era of budget cuts, devolution, power struggles on farming and creation of the SVS as an agency. The latter was both necessity, joy and nightmare. Every CVO needs an effective chain of command and as the agency worked to become independent there were many ups and downs in every day events and none more than during responses to exotic disease such as Newcastle disease virus, avian influenza and the FMD outbreak in 2007. Enjoyable times included speaking on priority topics such as animal welfare and global threats to biosecurity at OIE, leading the UK presidency of the EU, setting up a Government Veterinary Service as first Head of Profession to encourage young talents and seeing the VLA, a favourite jewel in the crown, become a successful business operation. This tenure as CVO exposed me to many challenges and important lessons on the working of government from three Secretaries of State in Defra (Margaret Beckett, David Miliband and Hilary Benn), two Prime Ministers (Tony Blair and Gordon Brown) and the accompanying machinery of civil service life. The honour of being invested Companion of the Order of the Bath (CB) for services to animal health was presented by The Prince of Wales at Buckingham Palace in 2008. A surprising legacy has come in the 10 years since leaving the role of CVO and followed a chance meeting with Professor Mo Salman of Colorado State University. This led to a wonderful and satisfying path to develop a National Animal Health programme in the country of Georgia in the Caucasus. The capacity building project was one of several for which the donor has been the US Department of Agriculture and where the skills of a former CVO were highly valued. The scale of destruction of private and government veterinary services in former Soviet countries including Georgia was quite shocking to discover, something completely underestimated by the West in 2008. It was rewarding to be part of this and to receive recognition through a certificate of appreciation from them in October 2018 as this decade and the project come to an end. Many lessons can be drawn from these events and many others of course. Being CVO can be a way of life rather than a job and one for which there is no longer a doubt that a man or woman is equally fitted. Getting there is a science route which women today have mastered just as well as men. This transformation happened in the UK in the 20th century but is not yet the global reality and the challenge now shifts to developing countries and to sustaining our progress. It took 111 years after the post of CVO was created in the UK for the first woman to be appointed. Of course, it wasn’t until 1927 that the Royal Veterinary College first started to accept women onto its study programme (see our article on another APHA scientist Connie Ford who was one of the very first women to graduate as a vet in the UK); but it still took 74 years for a woman veterinarian graduate to reach the top of the profession. That is a very high glass ceiling! The career of some of the scientists featured here spanned several decades and it is comforting to hear them say that they have witnessed a move towards a more inclusive culture in the workplace, especially in terms of gender equality. As Professor Debby Reynolds rightly points out, the challenge now shifts to sustaining our progress, and may I also add, to champion all sorts of diversity as an employer whether it is sexual orientation, ethnicity, faith, socio-economic background or neurodiversity. Join us again in December for the last instalment of the series in which some of my contemporary female colleagues look towards the future generations.